66 Comments	This post may contain affiliate links. 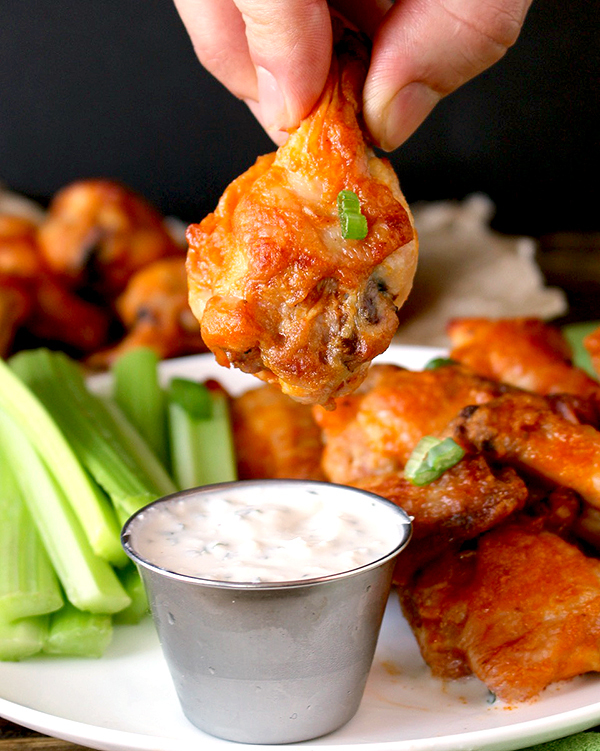 These Baked Buffalo Wings are crisp, double-dipped, and so delicious! Whole30, Paleo, gluten free, dairy free and just as good as fried ones. 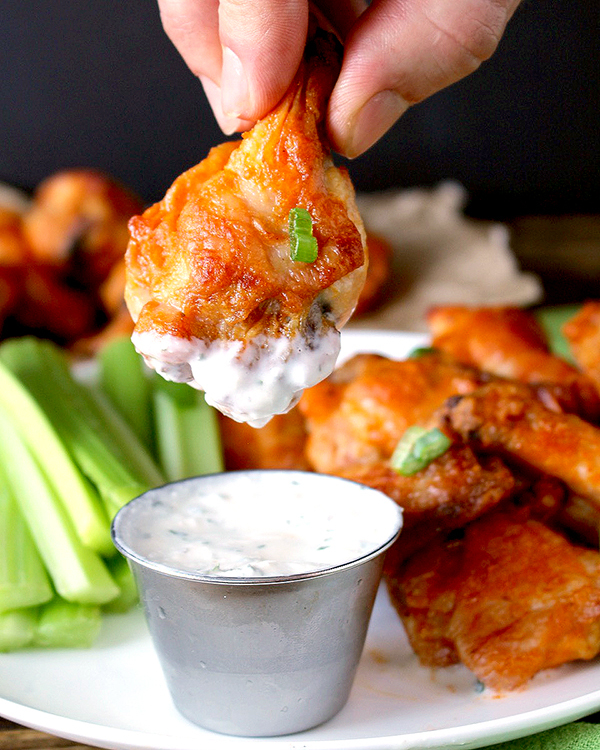 Chicken wings are the ultimate game-day food! Hand held, small enough that you can justify eating a ton, and so flavorful. My version uses ghee instead of butter, making them paleo and Whole30- you will love them with ghee! 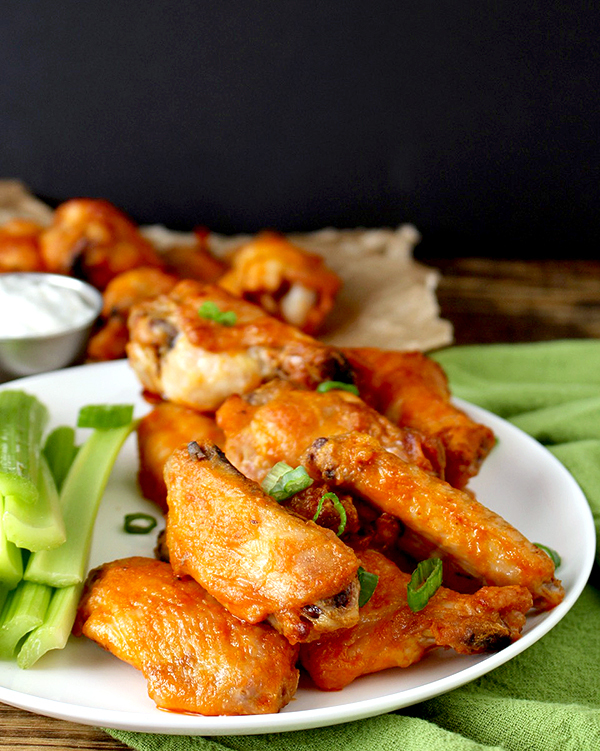 This recipe makes about 26-28 wings, enough to feed about 8 people as an appetizer or 2-3 as a meal. They fill one sheet tray perfectly, so they would be easy to double if you’re planning for a large crowd. Just fill up another tray and double the sauce. These are baked which makes them easy and there’s not a lot of hands-on time. It also means less of a mess! I bake them on a sheet tray covered in foil for easy clean up. I place a wire rack (like a cooling rack for cookies) on the tray so both sides cook and the bottom isn’t soggy. Once they bake they get tossed in the sauce and then baked again. 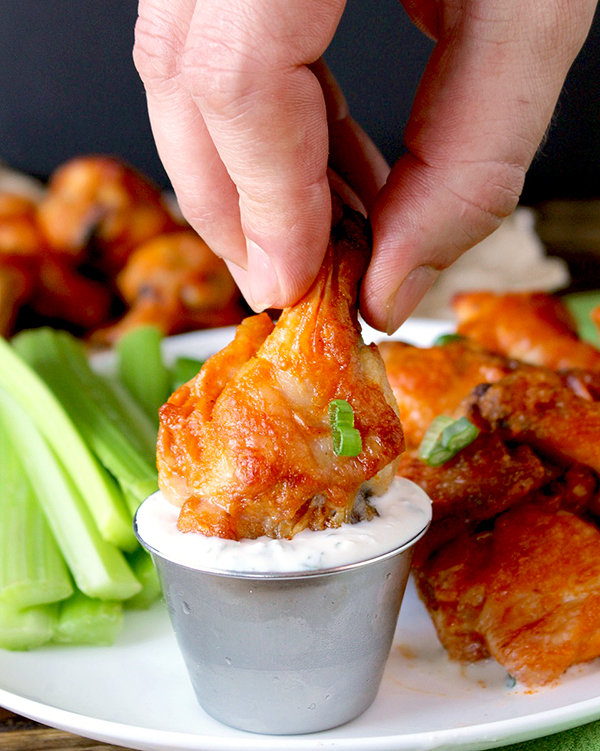 I like to do that twice to really make sure each wing fully coated in the saucy goodness. It’s a little extra work, but totally worth it! I specifically use avocado oil on these because of it’s high smoke point. Cooking them at 400° is no problem and I know the oil won’t burn. I got some questions about avocado oil in my Baked Fries post so HERE is where I buy mine for a really good price. Now that I made this classic flavor, I can’t wait to try more flavors! 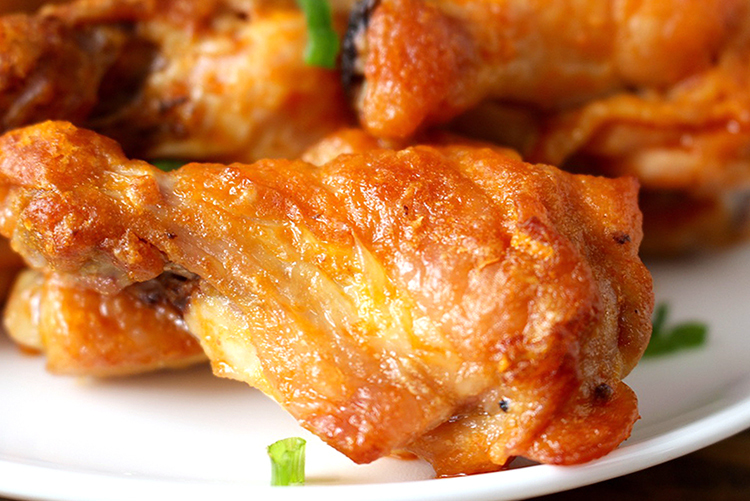 These wings are juicy, crispy, a little garlicky, buttery, with just a touch of heat. They are pretty messy, so keep some napkins near by. I serve them with my Ranch– it’s a classic combination!! Enjoy! Preheat the oven to 400° and line a sheet tray with foil. Place a wire rack on top of the cookie sheet. 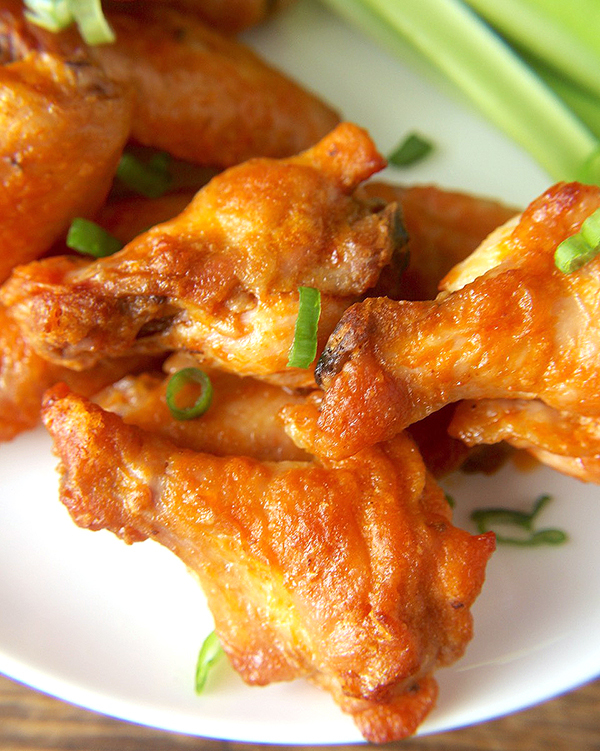 Place the wings in a large bowl and pat dry with paper towel. This will ensure crispy wings. Add the oil, salt, and garlic powder and toss until evenly coated. Place the wings on the wire rack, skin side up. During the last 10 minutes of baking make the sauce. In a sauce pan, mix the ghee and red hot until combined. I like to use a whisk for this to help it mix. Once wings are done, coat them in the sauce and place back on the wire rack. Tongs work best for this. Bake for 5 more minutes and repeat that process one more time. Serve with ranch, celery, and carrots if desired. Made these tonight!!! They were AMAZING!! 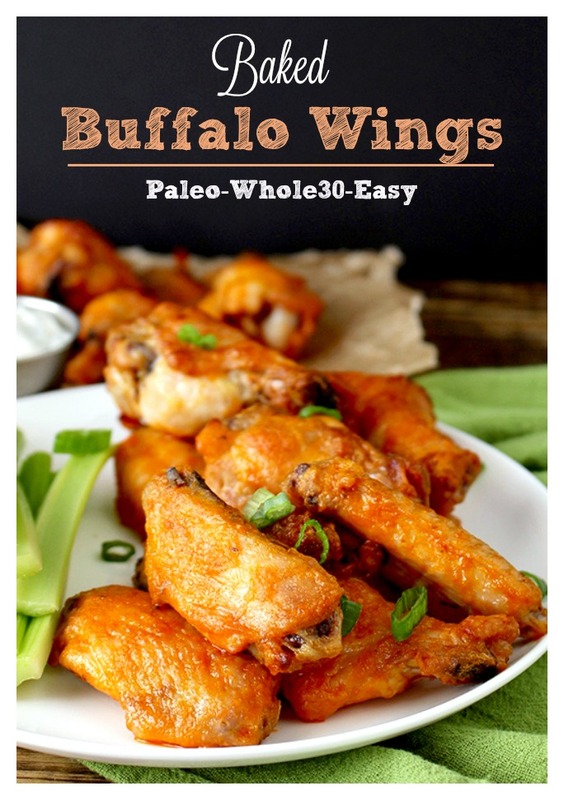 I’m always trying to find new paleo dishes that my whole family enjoys…my hubs said “WOW” at least 5 times with these wings!! Cooked them exactly as printed…except threw them on the grill for the last 5 minutes…they were just WOW!! Served them with dump ranch (after a failed attempt at paleo blue cheese…pretty sure blue cheese can not and should not be made paleo!!). Thanks for a great recipe!! You’re welcome, Sara! Thanks for trying them and for the great feedback! I’m so glad you guys loved them and grilling them sounds so good!! You should clarify that ghee is a dairy product. It is clarified butter. While it is made mostly from the oil of butter and contains only very small amounts of the dairy protein. It is a dairy product. If people are very sensitive to dairy, then this can still be an issue. But I am definitely making your wings! Your double dipping in the sauce is a great idea. My mouth is watering in anticipation. I am dairy and gluten free due to allergies. I make my own clarified butter as it seems to not bother me in small amounts. Thank you for your recipe! Hi Dawn- I hope you love the wings. About the ghee- it does come from butter, but if you buy a good brand like Fourth & Heart it is tested for lactose and casein which is what most people are sensitive to in butter. If you can’t tolerate butter, there’s a good chance you can tolerate ghee since all the milk solids have been removed. I’m definitely not trying to mislead people. Do you have the nutritional information for these? They are so good that my husband does not believe when I say they are okay for his diet. Haha! Thanks! Have made this several times and we love it! The measurements for the sauce usually have to be increased for us but I’m glad it’s easy to do! Delicious wings every time! Thanks for trying them, Kristin! I’m so glad you like them! Hi! I’m about to make these! I have a taste aversion to ghee, but am doing Whole30 so I can’t use butter in place of it. Any suggestions for something I can use for instead? Hi Channah- you can’t use butter anyway because it will burn. I suggest avocado oil since it’s neutral tasting. Hope you love them.